There’s an odd drama being played out in New York State this year. 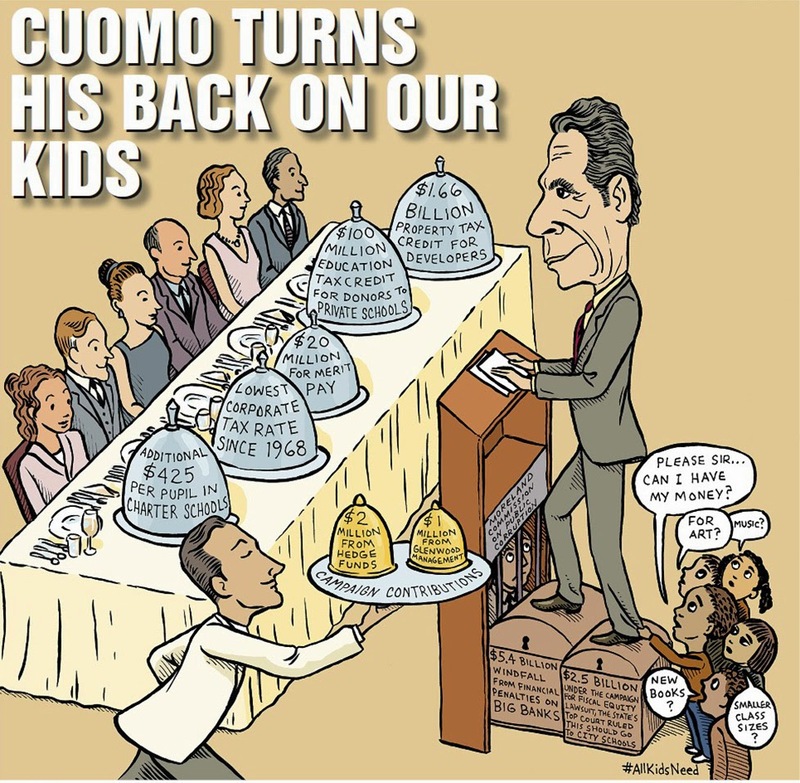 Andrew Cuomo, who awards himself the mantle of student lobbyist, has quite publicly refused to support our children. And we’re not talking chicken feed here. Under the CFE lawsuit, Andy Cuomo owes our kids 5.5 billion dollars. In fact, he owes the city alone 2.5 billion. Of course, there was a crisis, and he couldn’t pay for a while, but now that it’s over, where’s the money? Not only won’t Cuomo pay what he owes, but he’s set preconditions for giving kids even a sliver. In fact, he wants to take power away from the communities he owes and award it to himself. I shudder to imagine what Judge Judy would say to someone who failed to pay child support for years and demanded not only primary custody, but also the right to dictate parenting techniques. Instead of paying his debts, Andrew Cuomo demands more state testing to rate teachers. This is odd, because studies show that school grades, not standardized test grades, are a better predictor of student success. That doesn’t work for Cuomo, because he can’t control school grades. When the state sets cut scores, it can make it look like 90% of our kids are geniuses or 70% are failing. The governor can either say he’s doing a fabulous job and take credit, or that we’re in crisis and assign blame. Its a win-win as far as he’s concerned. Cuomo also wants to take control of negotiating contracts away from local school boards and offer some kind of merit pay system, basing teacher pay on the very test scores he will be manipulating. Merit pay has been kicking around for a hundred years and has never worked anywhere. It’s even more absurd when we base it on test scores based on the druthers of Andrew M. Cuomo. Personally, I’d argue that any teacher holding back the good stuff waiting on merit pay merits immediate dismissal, with prejudice. The governor further demands that communities relinquish almost all local decision making regarding teacher ratings. Under his proposal, 50% of a teacher’s rating will be based on classroom observation. But the people communities choose to run their schools will only get input on 15 out of those 50 points. Thus, Deadbeat Andy will have control over 85% of teacher ratings, while communities are left with largely irrelevant scraps. Perhaps worst of all, Cuomo wants to place troubled schools into receivership, taking control over schools he determines to be failing. Would they be doing better if the governor paid them the millions he owes them? Could that money be used to address the special needs of these children? Governor Cuomo doesn’t care. He knows better. Yet those of us who’ve watched NY state work its magic in Roosevelt have abundant reason for skepticism. Cuomo attacks our Long Island schools, largely regarded as excellent, because it’s the epicenter of the opt-out movement, loudly questioning his beloved tests. But the fact is all schools could do better if Governor Cuomo lived up to his obligations. Suburban communities face the triple whammy of the Gap Elimination Adjustment, Cuomo’s punitive tax cap, and his stubborn unwillingness to fork over what he owes us. It’s time for this deadbeat to pay up or shut up. If Governor Cuomo can’t be bothered following court orders to support our kids, he’s no student lobbyist. In this country, in 2015, deadbeat dads don’t get to make the rules.